Stretch marks happen to many women, whether they are a result of a pregnancy or just from growing too fast for your skin’s elasticity to accomodate. As tears in the internal layer of skin called the dermis, stretch marks require a specific intensive treatment in order to be diminished or erased. It’s extremely important to apply a cream that is able to maintain the skin’s natural elasticity to limit the appearance of stretch marks and diminish the signs of those already present. 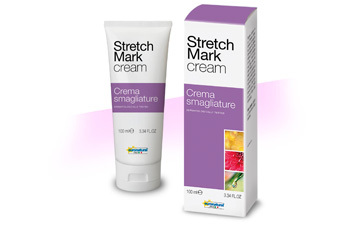 Thanks to the presence of effective actives, this cream stops hiding stretch marks and prevents future stretch marks to develop. The best thing about this emulsion is that you can use it before, during and after pregnancy to get the optimal result contrasting the formation of stretch marks and minimizing those already present. Formulated with “PEG FREE” plant-based emulsifiers from olive oil and wheat protein with extraordinary skin-enhancing properties. The silanol hydroxyproline has both a restructuring and restoring activity on connective tissue, particularly on elastic fibres and collagen strands. Micro-algae Chlorella vulgaris is important on the skin restructuring and the skin microcirculation as well. With natural oils and butters like Argan, sweet, Almond, Karitè, the product has an excellent eudermic, filmogeneus, hydrating and elasticizing properties. apply twice a day gently in a circular motion on all areas of the body where there are stretch marks. Apply two times a day, morning and evening.